Rand Paul has electrified conservatives nationwide and much of official Washington with his old-fashioned filibuster of President Obama’s nomination of John Brennan to head the CIA. Paul is a libertarian, and his filibuster is a protest against what he views as the Obama administration’s unconstitutional usurpation of power. He is right about the broader point: the Obama administration has a long history of lawless disregard of the Constitution and federal statutes. Unfortunately, I don’t think he is right about the specific point at issue. Senator Paul’s argument focuses on the Obama administration’s fondness for drone strikes as an anti-terrorism tactic. Drone strikes are a blunt instrument. They have often killed innocent people, reportedly numbering in the thousands. Killing terrorists, as opposed to capturing them, makes it impossible to get information from them. And the administration’s arguably promiscuous use of drones has clearly contributed to anger against the U.S. in countries like Pakistan. But I don’t believe any serious person questions the president’s power to order drone attacks on terrorist targets overseas. It is possible, I suppose, to imagine an extraordinary circumstance in which it would be necessary and appropriate under the Constitution and applicable laws of the United States for the President to authorize the military to use lethal force within the territory of the United States. For example, the President could conceivably have no choice but to authorize the military to use such force if necessary to protect the homeland in the circumstances of a catastrophic attack like the ones suffered on December 7, 1941, and September 11, 2001. 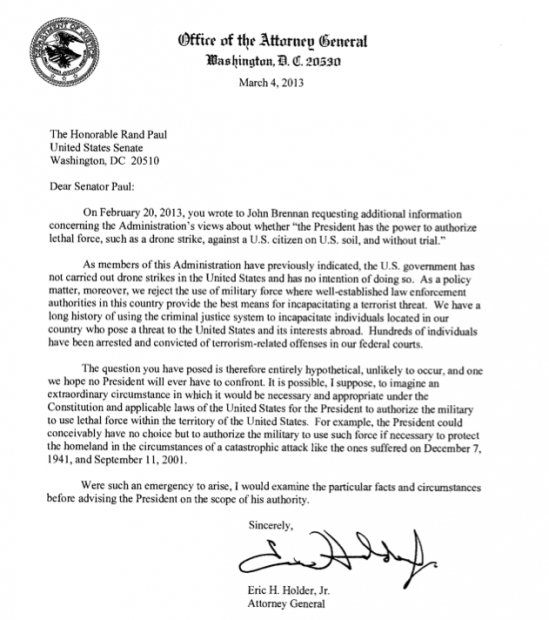 Here, Eric Holder is right, and Rand Paul is wrong. There certainly are occasions when the military can be brought to bear to defend our national security by killing American citizens within our boundaries. Holder cited one of them in his March 4 letter: September 11, 2001. It has been widely reported that after Islamic terrorists hijacked United flight 93, and it became clear that they were steering the airplane toward Washington, D.C., likely with the intention of blowing up the Capitol, President Bush ordered the Air Force to shoot the airplane down, if necessary. As it happened, the famous passenger revolt on Flight 93 ended the threat and rendered military action unnecessary. But does anyone doubt the constitutionality of President Bush’s order to take down the airplane, if necessary to stop the terrorists’ attack? I don’t think so. And bear in mind that the American citizens who would have been killed if the Air Force had been required to act were completely innocent. It was not a matter of due process, it was a matter of national defense. So whether the president can order the killing of an American on American soil is not, as Rand Paul put it, “a yes or no question.” Under virtually all circumstances, the answer is of course no. But are there situations, facing the extremity of a threat from malignant powers like hostile governments or Islamic terrorists, when the president could legally give an order entailing the killing of American citizens? Of course there are. For once, Eric Holder got it right. So my hope would be that as attention continues to focus on Paul’s old-fashioned filibuster, in which he has now been joined by a number of other Republicans and at least one Democratic Senator, the issue of the Obama administration’s lawlessness can be expanded beyond the narrow scope of Holder’s answer to Paul’s question. Whether that can be done in a way that relates directly to John Brennan’s nomination as CIA director is another question.